The Chinese New Year is the largest celebration in China. Lasting 15 days, this holiday is a chance for families and friends to come together and celebrate the new year. Gifts are exchanged and a lot of food is eaten. In finding the right New Year gift, many Chinese choose food items or teas that focus on health and long life. Since the Chinese see all teas being healthy and helping to aid in a long life, it seems hard to figure out how to narrow the field. This holiday is considered the biggest in China and one of the few where gifts are exchanged, so the quality of the tea is going to play a big roll in what is chosen as a gift. Also, with the new year during the dormant period for tea plants, much of the available tea in China will be fall and winter harvest oolongs and aged puerh. So with this in mind, here are 3 oolongs that would would be considered an appropriate to both give and serve as part of the Chinese New Year . Ti Kuan Yin – This beautiful oolong from Anxi in Fuijan province of China carries the name of Iron Goddess of Mercy. Kuan Yin, or Guanyin, gave guidance in a dream to a local farmer in Anxi on how to care for the tea plant and make this balled oolong. This brought prosperity to the farmer and the village. So this oolong is not only associated with health, but with prosperity. 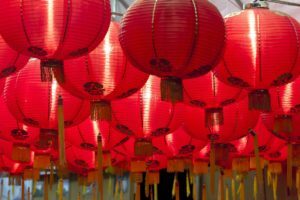 So it covers two of the biggest Chinese beliefs around the new year making it a perfect candidate for giving and serving. Fenghuang Dancong – This Phoenix Mountain oolong from Guangdong province is plucked from tea plants that are allowed to grow wild in gardens of other plants. These plants are older and larger than the plants kept in a traditional garden. The flavor profile is both sweet and vegetal. These oolongs have been around for centuries and are considered one of the best lighter oolongs from China. Tea from old tea plants is always valued in China and shows a level of care from the giver of the tea. Wen Shan Bao Zhong – This high elevation oolong from Taiwan (keep in mind China does not recognize Taiwan as a separate country), is also a fall harvest oolong and is prized on the mainly for its light creamy flavor. Taiwan oolongs are considered the best quality, even by mainland Chinese. So this would be both an exotic and highly prized gift. Regardless of which one you choose, all of these oolongs are worthy of any holiday. This entry was posted in Tea Culture, Tea History and tagged China. Bookmark the permalink.